Staff Selection Commission (SSC) invites applications for the post of Junior Engineers Group-B (Non-Gazetted) posts, in Level-6 in Various Department. Apply Online before 17 November 2017. Age of Relaxation :- SC & ST Category 5 years, OBC-NCL Category 3 years & PH Category 10 years. Selection based on Computer Based Written Examination (Objective Type Multiple Choice) & Written Examination (Conventional Type). Candidates have to pay Rs. 100/- through net-banking/credit cards or debit cards or cash through SBI bank challan. Women candidates and candidates belonging to Scheduled Caste, Scheduled Tribe and Ex-Servicemen eligible for reservation are exempted from paying fee. 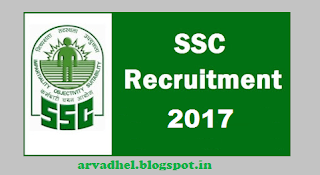 Interested candidates may apply Online through SSC website http://ssconline.nic.in OR http://ssc.nic.in from 21.10.2017 to 17.11.2017 till 5.00 PM thereafter website link will be disabled.